October 5th, 1947- Secretary of State George C. Marshall talks about hunger in Europe after World War II and food conservation. This was part of a special broadcast which included the first presidential address ever televised from the White House. See the video on YouTube. The UN World Food Programme (WFP) released a video today appealing for donations to feed Syrian war victims. The civil war, now in its 4th year, has left millions of Syrians displaced and in need of life-saving food from WFP. On this day in history, Secretary of State George Marshall called upon Americans to fight the remaining enemy from World War II: hunger. Still reeling from the destruction of the war, nations in Europe were suffering food shortages. Drought had struck that summer. Crops were ruined. The hunger crisis overseas intensified, threatening the recovery of Europe. 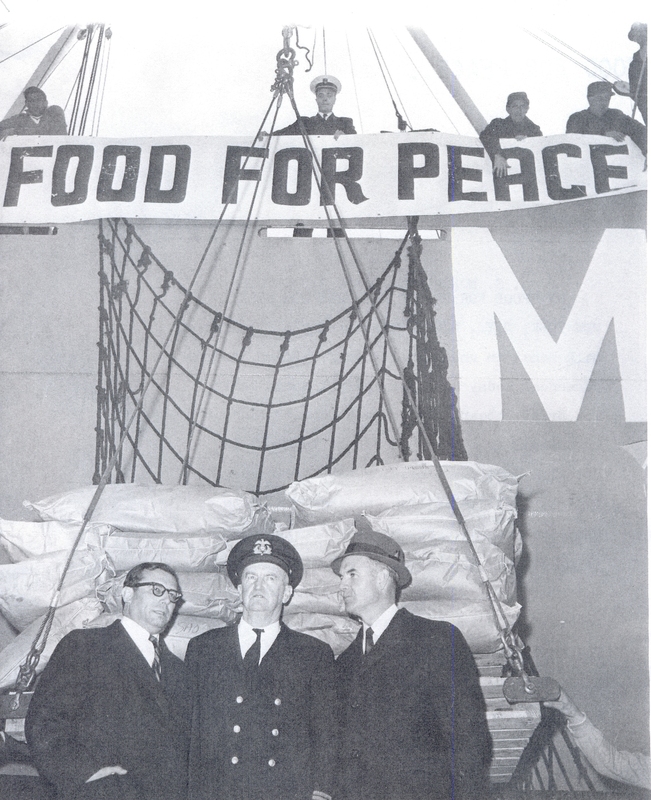 The fight against hunger was a critical aspect of the Marshall Plan to rebuild Europe. For without food, there could be no reconstruction. That winter the U.S. approved an interim food aid plan to feed France, Austria, and Italy. This food aid preceded the larger Marshall Plan, which was passed in 1948. Americans also donated food in the form of CARE packages and other instruments of humanitarian aid. Marshall’s words are timeless, and we need to remember them today. We are facing a global hunger struggle, with the most refugees since World War II. Wars in Syria and Iraq increase the numbers of hungry daily. Food is essential to winning the peace today as it was after World War II. Recently, I wrote about how you can raise money to fight global hunger by running and using the Charity Miles app. My fellow writer and runner, Elizabeth Paff, is joining in on this mission with a slightly different spin. Elizabeth (Biz) is going to run and raise money for a food called Plumpy’Nut that saves the lives of starving children around the world. For every minute Biz runs through December 14, I will make a donation to Edesia, a non-profit organization that produces the Plumpy’Nut. Each donation will buy a Plumpy’Nut meal (about 33 cents) which consists of a peanut paste fortified with crucial nutrients for children under the age of five. Without these nutrients small children can suffer lasting physical and mental damage. Plumpy’Nut (as well as its variations like Plumpy’Sup) are currently being used in emergencies such as the conflicts in Syria, South Sudan, and the Democratic Republic of the Congo. Plumpy’Nut, which comes in a packet, is a food that can be easily distributed in these dangerous areas as it requires no refrigeration or preparation. In crisis areas there is a race against time to reach the hungry and especially the smallest children as they are the most vulnerable. When the massive famine and drought struck East Africa last year it was Plumpy’Nut that saved many lives. When famine threatened the Sahel region of Africa this year Plumpy’Nut was again called into action. Edesia, which was recently featured on New England’s Chronicle TV show, produces Plumpy’Nut for aid groups like the World Food Programme, UNICEF, and others to use in the field. Biz is a member of the Leadership Pathways program at the College of Mount St. Joseph, and is an activist fighting hunger. She will log her miles at Mount St. Joseph’s indoor track. I hope others will sponsor her running too and make the donations to Edesia as I am. This will make an inspired holiday gift. I am already counting her runs both Tuesday and Wednesday of 40 minutes each to the tally. So please join in. Article first published as Running to Save Children from Deadly Malnutrition on Blogcritics. Brazil has come a a long way in its fight against hunger and developing its school feeding. Back in the 1960s Brazil got help from the U.S. Food for Peace program. Here is a photo of a milk shipment leaving for Brazil. George McGovern, a World Food Prize winner himself, is to the far right. Today, Brazil supports school milk programs such as the one in Haiti. See my article Got Milk? Haiti’s Farmers and Now Schools Do.